Popular Thai restaurant family, Giggling Squid, is delighted to announce its latest opening in the historic market town of Bury St Edmunds today. Centrally located near the Cathedral, on Abbeygate Street, the new site serves Giggling Squid’s signature Thai cuisine in a stylish yet relaxed environment. Dishes are freshly prepared from scratch in the kitchen by master Thai chefs and showcase the diverse flavours of the country. Open for lunch and dinner, the new 130 cover site is the biggest to date and will appeal to groups of friends, office workers or families in search of delicious and authentic food from this part of the world. The Giggling Squid menu offers a selection of seafood, meat, curry and stir fry options. Bury St Edmunds serves the renowned Giggling Squid Thai tapas lunch menu featuring an array of small plates such as Duck in baby leaf canapes; Seared scallop with spicy lime dressing; Thai pork dumplings; and Papaya salad. There is also a range of Tapas ‘tasting sets’ on offer priced between £9.75 and £11.95, each with a curated selection of dishes which perfectly complement each other. 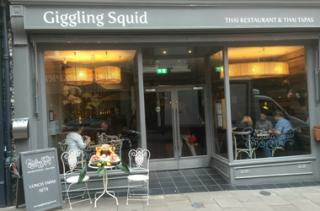 Choose from the Hungry Squid, the Wealthy Squid or Two Giggling Squids! The two dish meal combi, from £6.95, offers fantastic value for lunch time guests. The evening menu includes staples such as Thai green curry; Massaman chicken curry or for the more adventurous, the spicy Tropical jungle curry, combined with showstoppers like ‘Stand up seabass’ (a crispy golden fillet standing on its tail with peanut, fresh chilli, shallots, lime, lemongrass and ginger) or the ‘Crying Beef’, a North East Thailand special of grilled sirloin accompanied with spicy dipping sauce. And of course there are some tasty squid dishes on offer, including the signature Salt and pepper squid. Those looking for something lighter can opt for steamed dishes and salads such as the Ginger soy scallop (served in shells and steamed with soy sauce, sliced ginger, spring onion and shiitake mushroom) and Thai beef salad. For the perfect sweet hit, guests can tuck into desserts like Caramelised mango cake or Chocolate Feuillantine, as well as a range of ice cream and sorbets including black sesame, rose yogurt and mint and lychee made to request by Andy and Wa’s favourite little ice cream shop. Families can also take advantage of the Little Tapas menu, designed for children and featuring smaller versions of popular dishes including Chicken satay and Pad Thai. Like all Giggling Squid’s, Bury St Edmunds will have its own individual character and charm with high ceilings and antique exposed beams. Beautiful reclaimed street lamps inject instant character; dating back more than 100 years, they shape the centre of the restaurant and celebrate Thailand’s love affair with British culture. In keeping with the upcycling theme, the space will also exhibit a huge 18th century mirror, alongside classic Giggling Squid features, including walls finished with hand collected driftwood. An illustrious bookcase, filled with over 2,000 books from Bury’s local Oxfam, is a focal point in the room. Giggling guests are always encouraged to borrow a book, or two! Giggling Squid is owned by husband and wife team Andrew and Pranee Laurillard. The couple named their company after their two year old son, who one day, was wriggling and crying like a squid. They asked him ‘can you giggle little squid’ and both realised the name ‘Giggling Squid’ would be the one! Perfectly synonymous with the brand, Giggling Squid has a sense of humour, is playful and doesn’t take life too seriously. Having opened their first site in Hove in 2009, the pair has gone on to establish a strong reputation for staggeringly good Thai food which highlights street food and coastal specialities. The launch of Bury St Edmunds takes the family of restaurants to 15. Experience modern French fine dining featuring the finest local seasonal delicacies, lovingly crafted into artistic dishes. Expert bakers for the last 70 years, Greggs serve delicious, freshly baked, quality food at great value prices. Edmundo Lounge is an informal, neighbourhood food led cafe/bar open all-day, everyday.